Fossil Q Explorist Gen 3 Smartwatch 46mm Stainless Steel. Model Number: FTW4002. Stainless steel case. Color: Rose Gold. Case Material: Leather. Battery Size: Not Available. Manufacturer's Warranty - Labor: 2 years. Item for sale: Samsung Gear S2 Smartwatch SM-R730V - Large Band - Dark Gray (Verizon Wi-Fi). This Item is used. It is tested and working, and comes with everything pictured. Check my other listings. Shipping: Usually first class mail (2-3 Day time frame) - I will gladly combine shipping. Payment: This is a PayPal auction. I place a high value on all customers. I pride myself on fast shipping, quality merchandise, and customer service. Positive Feedback is appreciated. Ships with delivery confirmation. That number will be uploaded so the item’s whereabouts are never a mystery. Used. Good condition. A few scuffs but still solid. Never activated on Verizon, but free and clear if you want to. My current battery life is 28 - 36 hours depending on use with my note 9. Not a guarantee for you, usage will impact actual. Including 2 bands and 2 chargers. Shipped with USPS Priority Mail. Nike Space Gray Aluminum Case with Anthracite/Black Nike Sport Band. Apple Watch Series 4. Watch Base Glass is Broken. Works but Sold As-Is. I Assure you of Great Product, Pleasant Experience, Prompt Response and Great After Sales Service. Watch body color: Space Gray Aluminum Case. The unit contains multiple deep moderate dents/nicks/scuffs/scratches and may have issues pertaining to the LCD screen (i.e. dead pixels/spots/lines). However, it is fully intact and operational. Samsung Gear S2 Dark Gray 44mm Ceramic Verizon Smartwatch - SM-R730VZKAVZW . Shipped with USPS Priority Mail. (1) DI03 is compatible with most Android or IOS devices. If you have an iPhone (8.0 ) or Android (4.0 ) that supports Bluetooth 3.0/4.0, it should work fine. 1 x DI03 Smart Watch. 2) IP67 waterproof, dustproof. NEAR MINT condition, (9.75/10). Stainless Steel casing is flawless with the exception of a couple of light tiny scattered markings. Display is vivid and flawless with no discoloration, hotspots, or dead pixels. 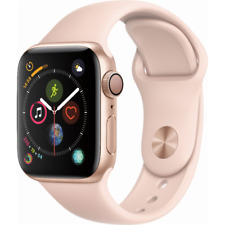 For sale is a Apple Watch Series 4 44 mm Silver Aluminum Case with White Sport Band. Plastic still on charging cord. Mobvoi Ticwatch E Smartwatch Shadow (Black) works with IOS and Android. Condition is Used. Does not come with original bands but it can be easily switched to other types. Comes with USB charger. No scratches, everything works as normal. 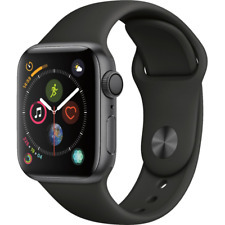 Apple Watch Series 4 44 mm Stainless Steel Case with Milanese Loop. GPS Cellular Under Apple Warranty until March 28th 2020. Comes with Milanese loop & charger adapter Condition is lightly Used Ships Fast & Free ! !